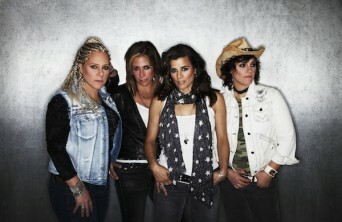 Antigone Rising, the New York based all-female-boot-stompin’-alt-country-rock band, has announced the release of two brand new EPs, “Whiskey & Wine — Volume 1” and “Whiskey & Wine — Volume 2”. “Whiskey & Wine – Volume 1” is set to drop March 25 on iTunes and the band’s official website and features the singles “Everything Changes,” “That Was The Whiskey,” “Call Me Crazy,” “Magnolia On The Breeze” and “Get To You.” Volume 1 will be followed later this year by “Whiskey & Wine – Volume 2,” due out October 28. The fab four comprised of Nini Camps (lead singer), Dena Tauriello (drums) and founding sisters Kristen Henderson (bass/vocals) and Cathy Henderson (guitar/vocals), are showing no sign of slowing down. Starting on March 25 the band will begin a never-ending cycle, one song at a time, releasing a music video, followed by an acoustic or alternate mix version. The goal is to provide audiences a variety of online content from video interviews to blog posts all year long. Treating each song as a single, the band will dedicate 6 to 8 weeks on the individual promotion of each of the five songs featured on “Whiskey & Wine — Volume 1”, and will keep the cycle going all through Fall when “Whiskey & Wine — Volume 2” gets its fall release. The infectiously catchy tune received praise from critics as a foot stompin’ mash up, perfectly blending the band’s ability to rock with their gift for writing undeniably catchy songs. The video for the single premiered on CMT.com, trending in the top 10. Co-written with Nashville songwriter Lori McKenna (Faith Hill, Little Big Town, Hunter Hayes), “That Was The Whiskey” has just been nominated in the “Country Song” Category in The 13th Annual Independent Music Awards. The girls have already been turning up everywhere from the pages of Curve Magazine, Billboard, Out Magazine, Buzzfeed, AfterEllen, the Huffington Post and Lesbian.com to appearances on “The Today Show” and “The Tonight Show,” among others. More recently, Kristen Ellis-Henderson garnered much media attention when she and her wife, business executive Sarah Kate Ellis (who was recently appointed president and CEO of GLAAD), were featured on the cover of Time magazine’s groundbreaking April 8,2013, Marriage Equality issue. Having dazzled audiences across the globe and invaded our iPods, Antigone Rising has never been more primed to take the musical world by storm. Posted March 24th, 2014 & filed under Entertainment.